Filmmaker Jordan Peele; playwrights August Wilson and Suzanne Lori Parks; actor and producer Viola Davis; Hip Hop theater star Daveed Diggs; ballerina Misty Copeland—we can find respected African American performers in every field of the performing arts. But as the show The Me I Want to Sing makes clear, that wasn’t always the case. In fact, performers of color still face obstacles and hostility related to race and prejudice, as can be readily viewed in the online trolling they face. Compared to their predecessors, though, they are less likely to encounter the institutional barricades between their talents and opportunities to share them. These opportunities did not spring from thin air. They are the fruits of seeds planted by previous generations of African American artists and their communities. Awareness of social challenges and struggles overcome by past artists of color provides historical and cultural context to what we now see onstage and onscreen, and listen to on our playlists. Marian Anderson and Leontyne Price stand as two twentieth-century artistic titans who sang their way across America’s color lines, specifically in the realm of classical music and opera. In music, images, and anecdotes, The Me I Want to Sing dramatizes the musical and historical journey these two women of color navigated. They consciously created and opened the doors for the unique voices and artistry that have followed—a hard-won prize that today is often easy to overlook. These brief biographical profiles of Marian Anderson and Leontyne Price provide historical context to their lives and achievements. 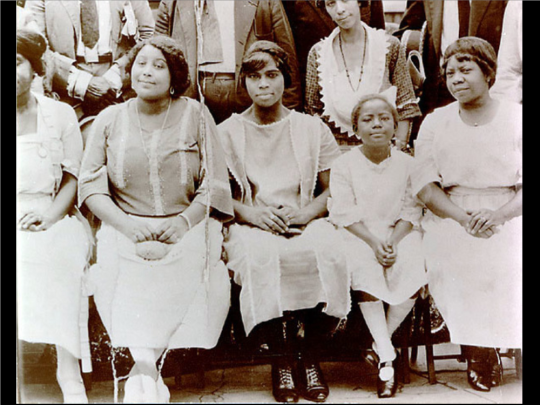 Caption: Marian Anderson (center) as a young woman. Born in Philadelphia, Marian Anderson (1897–1993) was singing in her church choir by the age of six. Her family supported her musical talents but they could not afford formal lessons. She refused to let that stop her, practicing and developing her talents largely on her own. Her church family later raised some $500—a large sum at the time—to allow her to train with voice teacher Giuseppe Boghetti. She subsequently won a contest through the New York Philharmonic Society and gained more notice. 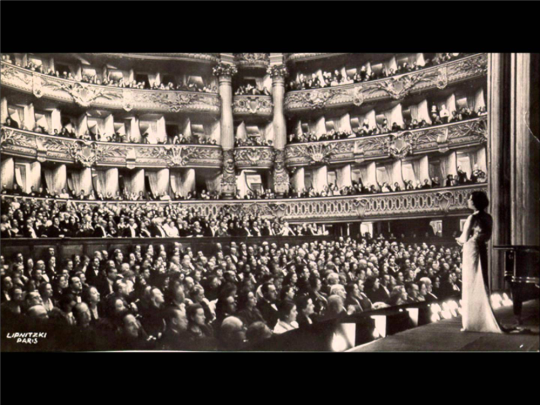 In 1928, she performed in Carnegie Hall and afterward toured Europe, winning international accolades. Caption: Marian Anderson performing in concert. Anderson returned to the United States regularly to perform, making a point to sing for African American audiences, including concerts in the deeply segregated South. After being denied the right to sing at a Washington, D.C. concert hall because of her race, she performed in front of 75,000 people at the Lincoln Memorial in March 1939. That event is viewed as one of the seminal moments of the mounting Civil Rights Movement. In 1955, she became the first African American vocalist to perform with the Metropolitan Opera. In 1963, President John F. Kennedy honored Anderson with the Presidential Medal of Freedom, the country’s top civilian award. She retired in 1965, but was named a Kennedy Center Honoree in 1978 and received a Grammy® Award for Lifetime Achievement in 1991. 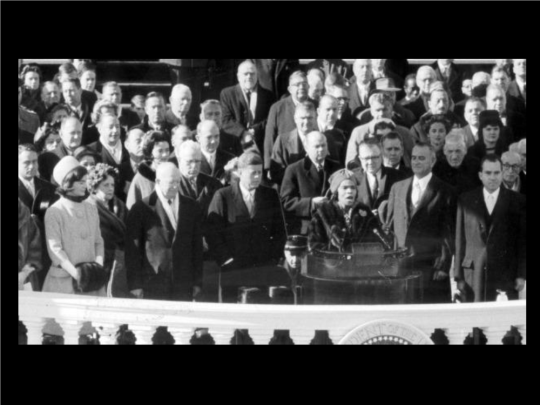 Caption: Marian Anderson sings the National Anthem at the Inauguration of President John F. Kennedy in 1961. 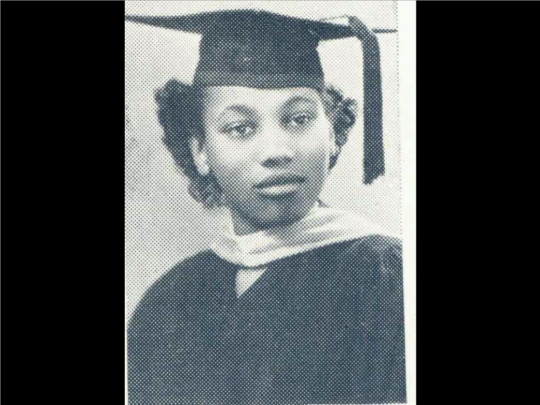 Caption: Leontyne Price’s 1948 graduation photograph from Central State University in Ohio. Leontyne Price (b.1927) was born and raised in Laurel, Mississippi, a small city in the Deep South. At age nine, she and her mother attended a concert by Marian Anderson, a moment that helped her begin to envision a future as a classical vocalist. She attended college in Ohio with the idea of becoming a teacher, but her teachers encouraged her to pursue vocal studies. She subsequently enrolled at the prestigious Juilliard School in New York City where she earned a scholarship. In the early 1950s, Price took part in European and American tours, including a tour of George Gershwin’s Porgy and Bess, performing the lead role of Bess. 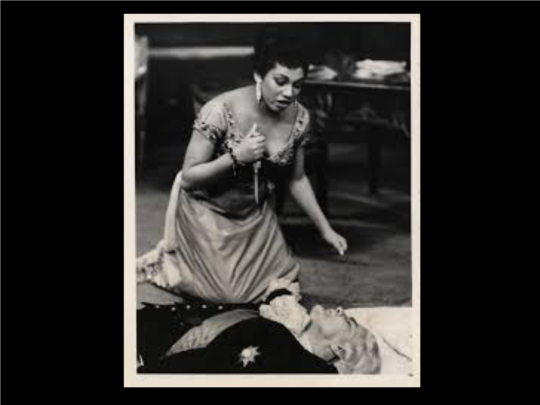 Caption: Leontyne Price appeared in Tosca on NBC Opera Theatre. Because Price was black, the broadcast was banned in many southern states. Price doubted her ability to make a career in opera, but the opera world already had taken note of her talent. In 1955, she appeared before a national audience via television, performing the lead in Puccini’s Tosca on NBC Opera Theater. From then on, she was in constant demand and crisscrossed the Atlantic for recitals and opera engagements, including her first turns in what would become her signature role in Aida. Her debut at the Met came on January 27, 1961, in Verdi’s Il Trovatore. Over the next three decades, she mixed opera appearances with concerts and recitals, her reputation as one of the all-time greats continuing to grow. Named a Kennedy Center Honoree in 1980, she retired from opera in 1985 and gave her last recital in 1997. 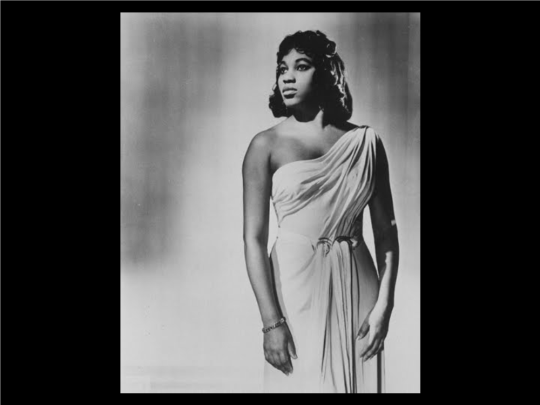 Caption: Leontyne Price in her signature role of Aida. Caption: Anderson and Price together. In 1896, the United States Supreme Court ruled on Plessy v. Ferguson, a legal case that challenged racial segregation on public transportation. The Justices ruled 7-1 that keeping the races separate was just fine, as long as the facilities were equal. To the surprise of few people of any color, most white Americans were happy to do the “separate” while ignoring the “equal.” “Separate but equal,” white supremacy, and Jim Crow—policies and laws meant to keep African Americans from voting or exercising other legal rights—were the de facto laws of the land. African Americans faced a particularly cruel social climate in the first half of the twentieth century. Lynching was a common atrocity in the Deep South, and keeping black families out of white neighborhoods and schools was standard practice in most every American city—South, North, East, or West. Meanwhile, African Americans served with distinction in both World War I (1914-1918) and World War II (1939-1945). They worked, paid taxes, and contributed to communities. Nevertheless, they remained second-class citizens in public, private, economic, and legal spheres. Having proven their loyalty and life-sacrificing dedication to a country that had a tradition of abusing them, African Americans grew increasingly impatient with empty promises of liberty, equality, and patience. As the Civil Rights Movement gained momentum, black performing artists played leading roles in breaking color lines and demonstrating again and again that the African American experience was an essential part of the American story. Artists like Marian Anderson, Leontyne Price, and others became increasingly visible in the different performing arts and other realms of American society. This timeline of the twentieth century includes some major “firsts” as more African Americans took their rightful place in America’s public spaces. 1910 The National Association for the Advancement of Colored People (NAACP) publishes the first issue of The Crisis, “a quarterly journal of civil rights, history, politics and culture…” It is considered the oldest publication of its kind, and is still in print today. Many of the best-known African American writers have published in the magazine. 1919 Oscar Micheaux releases his first film, The Homesteader, based on his novel. Micheaux is recognized as the first African American filmmaker. 1928 Blackbirds of 1928 opens on Broadway. The all-African American musical revue becomes a big hit with multiracial audiences. 1935 The opera Porgy and Bess, featuring classically trained African-American vocalists, premieres on Broadway. 1940 Hattie McDaniel is the first African American to win an Academy Award® for her supporting role in Gone with the Wind. 1946 Playing for the Los Angeles Rams, Kenny Washington becomes the first African American in the National Football League. 1947 Jackie Robinson breaks the color line in Major League Baseball and becomes a star for the Brooklyn Dodgers. 1948 President Harry Truman ends segregation in the U.S. Armed Forces with Executive Order 9981. 1949 William Grant Still is the first African American composer to have his work, The Troubled Island, produced by a major opera company in the United States—the New York City Opera. 1950 For her role in South Pacific, Juanita Hall becomes the first African American to win a Tony® Award on Broadway as Best Featured Actress in a Musical. 1950 Poet and author Gwendolyn Brooks wins a Pulitzer Prize for her book of poetry, Annie Allen. She is the first African American to win the prestigious writing award. 1955 In the case Brown v. Board of Education of Topeka, the U.S. Supreme Court rules the segregation of public schools is unconstitutional. 1959 Jazz greats Ella Fitzgerald and Count Basie win two Grammy® Awards each at the 1st Annual Grammy Awards Ceremony. 1964 President Lyndon B. Johnson signs the Civil Rights Act. This sweeping law prohibits the segregation of public accommodations like hotels and restaurants across the United States. 1977 The miniseries Roots—based on the book by Alex Haley—airs on national television. Watched by a record number of Americans, the show dramatizes the story of the enslaved African named Kunta Kinte and his descendants. 1986 The Oprah Winfrey Show becomes a nationally syndicated talk show. Over time, Winfrey develops into a beloved public figure and top media mogul. 1993 Author Toni Morrison wins the Nobel Prize in Literature for her novel, Beloved. She is the first African American to win the international prize. 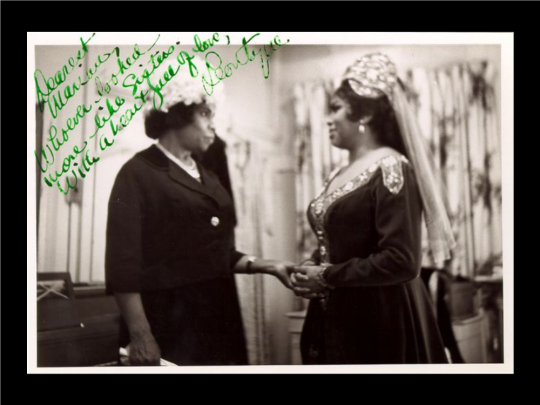 How the accomplishments of Marian Anderson opened opportunities for Leontyne Price. Who are other “trailblazers” you know of, from the past or present day? What role do they play in changing the status quo? What role have they played in your life? Anderson and Price’s identities as African American women affected their careers in ways big and small. How does identity affect people’s opportunities today? How does your identity affect your ideas about your life’s path? Art Song is a genre of vocal music usually sung with piano accompaniment in a recital setting. Classical Music technically refers to a period of European music that lasted roughly from 1750 to 1800. The music of this era will rarely feel too passionate or too emotional. In fact, it sounds balanced and even. For example, if a musical phrase has gone from a low note to a high note, odds are it will be answered by a phrase that moves from high back to low. Contralto describes the lowest range for a female singing voice. Marian Anderson sang contralto. Opera is a style of theater in which the story unfolds almost entirely through song. It is distinct from musical theater which relies to a greater extent on acting and dialog. Segregation is the policy of legally separating white and black races specifically in the American South by requiring them to use separate (nearly always inferior) facilities, such as water fountains, schools, and transportation. Soprano describes the highest range of singing voice. Leontyne Price sang soprano. Spirituals are religious songs associated with African American Christian churches. They often combine elements of European hymns and African musical traditions. How the spoken narrative creates context for the music. How the energy and emotion of the music reflects and reinforces the history being shared. Ways the projected images create a setting of time and place for the music and stories. The different styles of music featured in the performance, and the feelings the different songs may evoke. Named 2017 “Male Singer of the Year” by the International Opera Awards. An award-winning vocalist performing and recording in multiple genres, as well as devoting time and energy to the development of young classical artists. Composing music that incorporates classical, jazz, and Hip Hop. Conducting orchestras on the international stage. Ensemble of 18 Black and Latinx classical musicians. Ways Marian Anderson and Leontyne Price advocated for themselves, their dreams, their careers, and the African American community. Can you think of an instance when you pushed through obstacles in order to achieve something important to you? How at the age of nine, Leontyne Price was moved by hearing Marian Anderson perform and felt inspired to pursue her own dreams of singing. Have you ever felt inspired by the performance or actions of another person to pursue a purpose? In 1939, First Lady Eleanor Roosevelt resigned from the Daughters of the American Revolution when the organization would not allow Marian Anderson to perform at Constitution Hall. Ultimately, support from the White House led to a Marian Anderson concert on the steps of the Lincoln Memorial. What are helpful roles for us to play in supporting others who face unfair treatment? Minter sees opportunities for empowerment all around us. Think of something you want or need, big or small, that requires some planning and effort. Then compose a written plan with concrete steps and a time frame to achieve it. If you choose, share it with family and friends. As young women, hearing music and attending performances changed the lives of Marian Anderson and Leontyne Price. Go to a concert, musical, play, or other performance at your school or in your community. Think about the role the performing arts play in your life, and in the lives of young performers and their audiences. And if you aren’t already participating, consider getting involved. In her autobiography, published in 1956, Marian Anderson wrote: “Not everyone can be turned away from meanness and hatred, but the great majority of Americans (are) heading in (the right) direction. I have great belief in the future...” Write Ms. Anderson a letter, offering an update on the direction the country is heading today in terms of social improvements and ongoing challenges. What does code-switching mean to you? (Code-switching can be between cultures, economic classes, religions, sexualities, or involve other aspects of identity.) When are times you have code-switched in order to communicate and get along with others? Draw, paint, or create a collage that illustrates how you understand and practice code-switching in your life. Or write a story or script that illustrates the peril and humor of code-switching gone awry. “Black Opera Stars: More Than Just the Sopranos” by Jada F. Smith. The Root. May 20, 2011. Marian Anderson and Leontyne Price—their voices helped change the soundtrack of the twentieth century. Their determined efforts to perform were also instrumental in eroding prejudices that were barring African Americans from classical voice performance and opera, as well as other artistic and social realms. The Me I Want to Sing interweaves the music, narratives, and images of Anderson and Price. It dramatizes the changes they helped bring to the American cultural landscape by means of their artistry and resolve. This adult guide is designed to facilitate conversations about the living links between present and past for artists of color. To set the tone for discussions with young people, consider sharing something from your personal experience that relates to the show and its themes—perhaps the story of a public figure or personal hero who successfully challenged convention. The intention is to invite reflection and conversation among your young theatergoers. In leading discussions of The Me I Want to Sing, you can use open-ended questions to help students spot details they may have missed in the show, to dive deeper into the show’s content and themes, and to engage with potentially controversial content that may come up in discussions—issues such as racism, discrimination, and prejudice. When necessary, you can encourage students to back up their views with supporting evidence from the production itself or a trustworthy third-party source. What were the social and racial landscapes during the careers of Marian Anderson and Leontyne Price? How do they compare to the social and racial landscapes of the United States today? As a collaborative exercise, recount notable moments in The Me I Want to Sing: What got your attention or surprised you? What new information or ideas came to mind by the end of the performance? How do we define, describe, and demonstrate identity? What role do people’s identities play in their creativity, artistry, and the arts? Work with your young people to create a list of performing artists of color—singers, actors, dancers, etc. Why do some artistic disciplines seem more diverse than others? What is the historical context of that diversity? What are ways media, especially social media, shape today’s ideas about artists and their artistry? What do they already know about race relations and segregation in the first half of the twentieth century? What more would they like to learn? What do they know about African American performing artists of that period? What do they know about—and what are their feelings toward—opera and classical music? Would they be interested in listening to recordings of Marian Anderson and Leontyne Price? Would they like to take an online tour of the Kennedy Center? Follow their lead on how they want to prepare, from theater etiquette and stagecraft to background research on Marion Anderson and Leontyne Price. You will find some ready resources below. Collaborate with your young theatergoers to determine how they want to process the production afterward. Let them brainstorm ways to get the most out of the experience and make the subject relevant to them. You may also revisit the questions discussed in the “Before the Show” section above. Revisit “Check This Out…” and “Think About This…” in the Student Guide. Use these sections to stir discussion about the production, its music, and the social realities the show recounts. Identity relates to how we see ourselves and others, and how we form and apply ideas about who we are. Ideas of identity profoundly affected Marian Anderson and Leontyne Price, as dramatized in The Me I Want to Sing. Their identities were front and center in the racial discrimination they encountered, as well as their presence as women of color in the world of classical music and opera. Empowerment is the active effort of individuals or groups to tend to and meet their needs. Empowerment can be as simple as making breakfast for ourselves or taking on a job to pay our own way. It can be as complex as pursuing a long-range personal dream or organizing with others to overcome barriers to equity and fairness. “Lifting As We Climb” is the motto of the National Association of Colored Women’s Clubs (NACWC). The motto refers to ways communities and individuals of color can work together to help each other reach their potential. In Marian Anderson’s case, her church community supported her efforts to receive classical training as a young woman. For Leontyne Price, her family and community also helped her begin her life as a vocalist. Along their journeys, both women continued to act on a responsibility to help other young artists achieve their ambitions. Use activities in the “Take Action” section of the Student Guide, such as creative writing and artistic projects, that students can use to explore these ideas in relation to their own lives. These activities are designed to be scalable for a diversity of learning styles and/or abilities. The work of playwright and author Tom Minter explores the dynamic nature of diversity. In the 2014 commission of Blues for a Royal Flush, he weaves together the lives of singers including Ethel Waters, Ella Fitzgerald, Lena Horne, and Billy Strayhorn, all in the orbit of D.C. native son, Duke Ellington. Along with Washington National Opera, Minter has focused on creating work that reflects the individuals who make up the tapestry of our communities. The libretto for his one-act opera, Graffiti Corner, celebrates the life and neighbors of Washington’s Northeast neighborhoods. Most recently, Just Out the Window examines the gentrification of Washington, D.C. through music, and the eyes and cameras of students from the Duke Ellington School of the Arts. Kennedy Center: Was there a specific seed of inspiration that The Me I Want to Sing grew from? 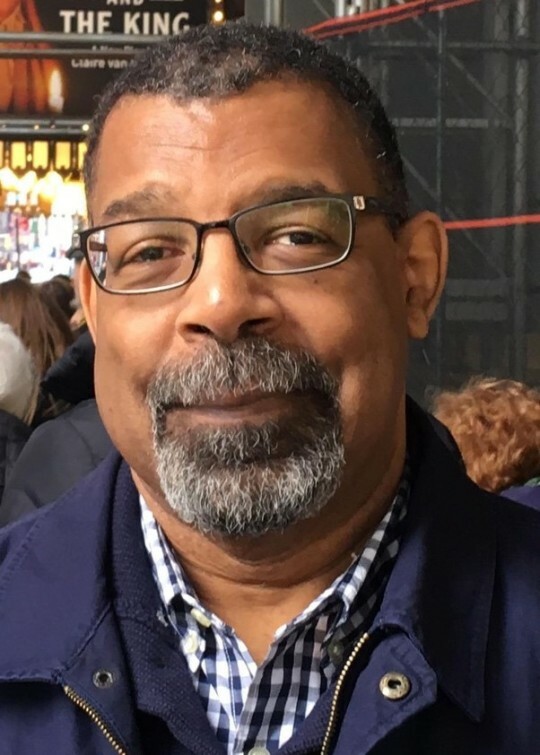 Tom Minter: This show was a commission from the Washington National Opera, and meant to specifically celebrate Marian Anderson, who is a Kennedy Center Honoree . With that I saw an opportunity to celebrate intergenerational connections, between classical singers of color, in the ways in which Marian Anderson opened doors for others. Marian Anderson wanted the freedom to sing art songs; opera came later in her career. From the beginning, she embraced a mission to show “what is possible,” especially to people of color, and possessed an innate understanding that dreams need nurturing, especially those of children. In the span of her long career, Marian Anderson crossed thresholds into rooms that had been closed to others, and in so doing opened doors, and windows, and eyes along the way. One significant pair of eyes she reached were those of a nine-year-old Leontyne Price whose mother had brought her to the balcony in a segregated theater in Mississippi to watch a woman of color sing. That little girl didn’t necessarily know what Marian Anderson was singing, but she saw a woman of color onstage, in dignity, looking magnificent, singing beautifully, and seemingly speaking to her. KC: You’re a playwright and writer with a strong relationship with classical music. What does that relationship stem from? TM: My father started out as a teacher of choral music in junior and senior high schools in East Harlem. My mom was [a] singing artist and sang opera. So the legacy of music in my family runs very deep. As a child I experienced first-hand what opera allows to be amplified, in terms of storytelling. There’s a family story about when I was growing up. I was with my father in the car, driving somewhere, with the classical music station on. The “Triumphal March” from [Verdi’s] Aïda came on and I apparently got very excited. Dad, being an educator, immediately followed up on this teaching moment. He went out and bought a recent recording that featured Leontyne Price and Jon Vickers under the direction of Georg Solti. My father introduced me to the libretto, showing me how the Italian appeared on one page and the English translation on the other. He didn’t know what to say when he found that I was captivated, and sat between the stereo speakers for three straight hours! I have had a several great passions in my life. They include the career of Leontyne Price, as well as studying the journey of Giuseppe Verdi and his revolutionary impact in melding words, emotion and music into drama. KC: What would you say to young people who might roll their eyes at classical music or opera? TM: Music is a natural form of expression for children. Too often, I think we over-mystify music. We need to knock down every single wall that stands between young people and musical experiences. I am deeply grateful to my family for creating an environment where music was not mysterious. I have had the freedom to roam in any kind of music that engages me. Opera is a way of amplifying stories in a unique way. For parents and caregivers, they can facilitate how a child interacts and responds with the world-enhancing experiences of word, music, and story as part of their inherent playfulness. In Italy, France, and other countries, there is a rich history of connecting music to word and storytelling. (Perhaps not as much in the United States in such fashion.) The reason Marian Anderson and Leontyne Price are so incredible is the way they glow as they perform their art, imbuing an audience with desire to experience their own gifts of song in such a way. How can we not have children understand that empowerment and the gift in this art form? KC: In The Me I Want to Sing, you make a point of emphasizing how Ms. Price’s career in a sense stood upon the opportunities of Ms. Anderson’s. How important has that solidarity been in developing the talents of artists, especially artists of color? TM: I think it’s critical. Audiences need to be able to see themselves reflected in the art—any art. And that solidarity is important for people of color, youth of color, who are interested in any of the arts, or anything in life. In Marian Anderson’s case, it was her church community that gave her the support she needed as a young person and vocalist. Historically, the church has been such a mainstay for black families, especially at that time. They saw that this young woman should be allowed to sing anything that came out of her mouth! It is unfortunate, but in the case of opera, artists of color continue to be underrepresented, or find themselves involved in new iterations of Porgy & Bess, Showboat, or even Scott Joplin’s Treemonish. Perhaps having focus on newly composed operas, such as Champion, by Terrance Blanchard, there can be room for Troubled Island, by William Grant Still with a libretto by Langston Hughes, which speaks for itself as legacy of black talent in this art form. But in saying that, we should not forget such talent should also be represented across every facet of performance, from stagehand to Executive Director. KC: What would you say to educators and school administrators about the importance of this artistic process in our schools? TM: We need to educate on a spectrum that includes the arts in the mix of other aspects of critical thinking that our youth are already aware of. They are doing things with technology, for example, that are astonishing to me! They are already being creative artists every day, creating intuitively on social media and in their own paths as young artists, and not always within the scope of a classroom’s stream of education. What do we educators have to offer? In my mind what’s slipping most is context. We must remember that “context is everything” in being able to apply critical thinking, and that our collaborative help in framing events and experiences is valuable for young people. That’s a realization Marian Anderson came to early on. She wanted her music, her art, to reach beyond the limits of what American culture allowed at that time. It was important to her that African Americans be able to see and hear her without being segregated and treated as second-class citizens. In doing so, and in igniting the dream of a Leontyne Price, she was instrumental in showing the way to breaking down some of the barriers that were blocking African Americans from the arts—and the arts from the contributions of African American artists. “Marian Anderson.” PBS Biography. An hour-long program that explores Anderson’s life. “NEA Opera Honors: Interview with Leontyne Price.” National Endowment for the Arts. June 3, 2010. Reflections on her life and career. “How to Start Appreciating Classical Music.” Deep Cuts. March 21, 2017. A video survey course defining and exploring classical music. “Opera 101, Opera Basics.” The San Diego Opera Podcast. June 10, 2013. When we want to know more about the art form. Start at about the two-minute mark (2:00). Presenting Sponsor of Performances for Young Audiences. Additional support for The Me I Want to Sing is provided by A. James & Alice B. Clark Foundation; the Kimsey Endowment; The Morris and Gwendolyn Cafritz Foundation; Paul M. Angell Family Foundation; Anne and Chris Reyes; and the U.S. Department of Education.